Each Internorm entrance door is a unique piece, because each entrance door is produced exactly according to your wishes and is then custom-made. Five aluminium and two timber-aluminium door systems with countless models are available. Design your entrance door exactly to your specification. Decide between a full door leaf or a door with glass cut-out and then select the desired side elements, fanlights, handles, colours etc. There are no limits to your design. Our entrance doors are available in many designs, matching the style of your house and matching your Internorm windows. We have grouped the different building designs into four design styles so that you can find the model faster which best suits you among the huge choice of entrance doors. Naturally, we place great emphasis on high-quality processing and fitting of proven security locking systems. 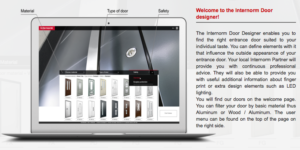 Click here for Internorm Door Designer – customise your doors with this simple app.